LPG (Liquefied Petroleum Gas) is a natural hydrocarbon fuel made up of propane and butane. LPG has several applications which include domestic or agricultural heating and vehicle fuel (often referred to as ‘Autogas’). A vehicle can be converted to run on Autogas (as well as existing petrol) which makes it both cheaper to run and more environmentally friendly. It is then referred to as a ‘bi-fuel’ vehicle. LPG can be purchased (in the UK) from 45 to 65 pence per litre, making it much cheaper than petrol. If you are considering an LPG conversion then there are many things that you should know and consider. A lot of these I have learnt myself through my own journey of discovery with an awful and unsafe LPG conversion by a 'reputed' LPGA Approved Installer (The LPGA is a UK trade organisation for LPG). Modern diesels (especially BMWs) have come a long way in recent years. The BMW 320D, 330D, 335D, 530D, 535D are all very rapid cars. However, in my experience with the 320D and 530D models (E46 and E39), any savings made via extra diesel MPG are negated if you suffer a turbo or injector failure. Turbo failure can also damage the cats and although injectors can be reconditioned, this process is very expensive. It has recently emerged that there appears to be a serious problem with the E46 BMW 320D (and the E46 184 BHP 330D (auto), E46 204 BHP 330D and E60 530D less so) suffering from swirl flap failures. The inlet manifold contains variable swirl generating flaps which are prone to braking off (or the butterfly valve fails) and being injested by the engine - a very expensive bill results! They are designed to reduce exhaust pollutions and are found on the M47 (2.0d) and M57 (3.0d) they are found on models with auto gear box (3/2000 onwards). On newer M47N and M57N/N2 (E60/E61) flaps are on all models (also with manual gear box). By inspection we can see that the flaps were revised sometime in 2004: My October 04 320d Touring and an April 04 Coupe on here have both been found to have the new flaps fitted from the factory but in the old manifold. The manifold part number was not updated presumably because the flaps are separate little parts to the manifold and probably have their own part number internal to Mark IV Automotive (the company who makes the manifold/flaps.) BMW, on the other hand, only keeps a part number for the full manifold/flap assembly. When people have asked BMW about the July 2005 manifold part number change they have said it was was purely an administrative action. If our first posit is correct then this implies that during 2004 BMW carried on purchasing manifolds under the old number with the new flaps in and that the July 2005 change was them playing catch-up: The part number was updated to reflect the change even though for the better part of a year that the old part number bought you the new part. This is correlated from people on here who have bought the manifold with the revised flaps under the old part number and, when querying it, been told that, yes, it is the new one - presumably the stores people knew that the flaps had already been revised. The revision is in the spindle size: The old spindles were 4mm all the way along while the new ones are 4.5mm apart from a step down to 4mm for the lug that has to fit in the existing hole in the manifold. While I had read much about the spindle sizes, when I took mine out, without cleaning the muck off the spindle it's actually not directly obvious - I didn't realised there was a step in mine until I put the calipers on them and this made me wonder how many people have only measured the end of the spindle without realising there is a size change? This made me twitchy and made me wonder that perhaps the failed spindles had been mis-measured and they were 4.5mm - I'd just put my flaps back in assuming they were good! With this in mind I asked in another thread for photos of some old flaps for some concrete proof that the spindle size change was definitely the revision and here we have it. While the finding of an April 04 Coupe implies that all Tourings/Saloons/Coupes are likely to be safe from early 2004 as these are the big sellers, there has been a mid-04 Compact with the old flaps. Not being as big a seller as the rest and possibly being built in a different factory means they must have got through engines at a slower rate and there will be a later change over date. The above problems, however, are not limited to BMW diesels as other manufacturers appear to be employing these new technologies to improve the performance and fuel consumption of their diesel vehicles too. Whilst it is understood that 'speed to market' is important, one wonders whether sufficient testing has been carried out at the design engineering stage. There is no doubt, however, that diesel is now a force to be reckoned with but a lot of this choice is about the total ownership experience and what kind of buyer you are. I, personally, do not buy new and rarely sell quickly. I travel a lot for work and would prefer one decent car which I will make good use of. As a result, I am not worried about re-sale value. I also wanted a V8 before more uncertain times hit the world in terms of the economy, environment and fossil fuels in general. More than anything, I enjoy filling my gas tank with 40 GBP of LPG and it lasting 350 miles - a V8 for Nissan Micra money. Automatically translated from German (may contain errors). + particles not discharged with LPG. Beside the limited pollutants (CO, HC, NOX, particle) there are so-called not-limited pollutants (e.g. SOX, NO2, benzene, formaldehyde etc., which develop with the burn of fuels. Natural gas, as fuel, is the best of the comparison. Liquid gas is slightly better than the average. Gasoline is slightly worse and Diesels worse than the average. The exhaust gases of Diesel engines exhibit a high carcinogenic effect potential compared with the others (LPG, CNG and gasoline). The carcinogenic effect of the Diesel exhaust gases is on the discharged particles and partially the substances responsible to it (e.g. Aldehydes to lead back PAH). By the introduction of particle (particulate) filters for diesel engined vehicles the particle emission (per driven kilometer) and with it the carcinogenic effect can, comparably, be lowered. In regards to soot, modern diesel engined vehicles discharge less large particles, small particles are however more easily penetrate the lungs and settle there. The reduction of the output of substances, which are relevant for the greenhouse effect, over up to 20% in the comparison to the petrol engine. In cold condition the engine oil is still high-viscosity and cannot not in full measure its lubrication function notice. A part of the heat of combustion is derived for the heating up of the engine, so that for the actual achievement yield at the beginning of less energy for order stands than with operating temperature. Within the wall range by the cylinder and the cooling agent warmth is derived, whereby the necessary burn temperature is not reached and relatively much hydrocarbons is set free. This phenomenon partially one against-works, as the air relationship is reduced. One speaks of the fact that the engine starts in the fat range. Since in this case more fuel is present, than is necessary for a stoichiometric burn relationship, a part of the fuel is only partially burned again discharged unburned or. In addition increased pollutant values come off thus that the catalyst is not yet on operating temperature and cannot therefore its function of the pollutant reduction not fulfill. An advantage of LPG engines opposite petrol engines is that the fuel is present already gaseously and therefore a better mixing with air is possible. With liquid fuels such as gasoline the evaporation rate is at small temperatures so low that only a relatively small quantity of gasoline vapors is present. Since gases and gas mixtures are more easily entzündbar than for example gasoline droplets, no or only small problems arise with liquid gas. A Anfettung as in the gasoline enterprise with nearly sixfold normal amount of fuel is not necessary therefore. The liquid gas/air relationship is almost always identically and independent in the comparison the petrol engine relative to with the LPG engine of the ambient temperature. The replacement of spark plugs before the mileage recommended by the vehicle manufacturer is necessary only with vehicles, which are equipped with a venturi plant. With these usually older vehicles the premature change is necessary, in order to reduce the danger of backfire. With vehicles, which are equipped with newer, gas injection systems so mentioned, the danger of backfiring and a premature exchange of the spark plugs does not exist and is, therefore, not necessary. Since liquid gas is however not as 'ignition joyful' as gasoline, it can occur that it comes by the normal wear of the spark plugs in the liquid gas system rather to ignition misfires as in the gasoline enterprise. In this rather rare case the spark plugs would have to be if necessary in former times replaced. Liquid gas is considered as a low-pollution fuel. It has very small sulfur content, a high degree of purity and burns practically arrears-free (no soot). LPG is suitable for closed workshops. LPG vehicles are suitable for fleet operators in population centres, because many vehicles can be refuelled from a gas station. Liquid gas has a relatively large range with a tank filling compared with other alternative fuels (passenger car: approx. 600 km). The constructional organisation of tank geometry is to a large extent, utilised. LPG is not soluble with water and cannot endanger the groundwater. When refuelling no contamination of the underground can occur. LPG has lower pressure (max. 30 bar) than natural gas (200 bar) or hydrogen (200 bar or low cold with T = - 253 °C) to be stored. The burn is “more softly” (more quietly) and even more so than with conventional fuels. It steps only a small load of the engine oil on (no soot, no fuel dilution, no steam bubble formation), which could cause a viscosity reduction. The engines exhibit a relatively long life span. LPG does not need additives, since because of the higher octane numbers compared with gasoline and the arrears-free burn chemical additives are redundant. The anti-knock quality is relatively high, whereby a higher compression ratio can be run than when on petrol. The vehicle re-equipment is problem-free possible and cheaper than with natural gas vehicles. 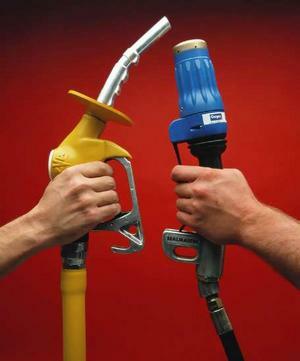 The power requirement and the costs of gas stations are smaller than with natural gas (no large compressor). Compared with gasoline and Diesel liquid gas is clearly cheaper. Liquid gas is independent of a pipeline net. LPG converted vehicles were built/optimised for petrol use and may exhibit loss of performance when running on LPG. LPG conversion often results in a loss of boot space / spare wheel space where the tank is inserted. Running solely on gas is not practically possible unless your country/regigion contains many LPG stations. The pay-back period for conversion is dependent on the number of miles you do - the greater the mileage, the quicker the pay-back. LPG conversion and repair/servicing can only be carried by those who have been trained in the particular LPG equipment. Not all cars can be LPG converted. Liquid gas is heavier than air and collects, it does not evaporate as fast as natural gas or hydrogen.